Does the recent onslaught of homework and quizzes have you down? Maybe the thought of having to read three books next week is starting to strain your sanity? Or perhaps the cold, gloomy weather is wearing on your spirits? Never fear! 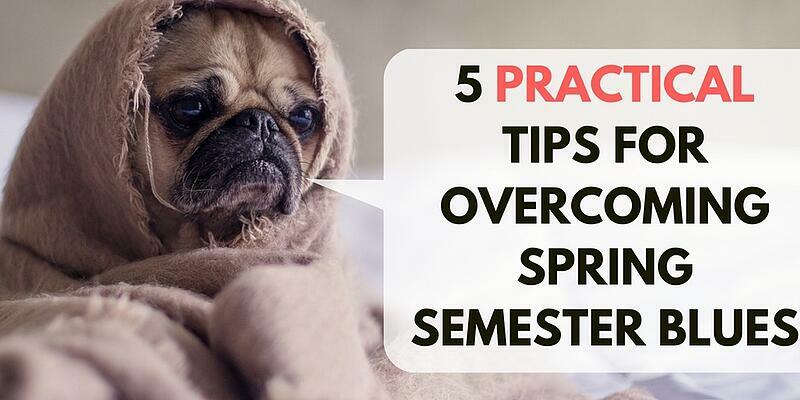 Here are our top tried-and-true tips for surviving the spring semester blues and staying motivated. A countdown will help you keep all of your deadlines and responsibilities prioritized as the weeks pass by and show you how close the finish line is. Download an app like Countdown from Sevenlogics, which allows you to customize a slide show to play behind the countdown. You can use photos of your friends, family, or pets. That way, you are not just watching the days tick by but reminding yourself of the reasons you do what you do. What better motivation is there? Have you ever sat down to do some homework or send an email and, 30 minutes later, realized you have not even started on your task because you picked up your phone? In order to avoid distractions from Instagram, texts, or even calls from your aunt, turn your phone on airplane mode when you really need to buckle down and study. Additionally, if you find yourself browsing Buzzfeed when you should be researching for a paper, download a browser app like Stayfocusd or Forest. You can adjust the settings to block you from certain websites for various amounts of time. Buzzfeed, be gone! Hello, almost finished essay. When it feels like you are slogging through your tasks and you want to quit, take a quick break. Go for a walk, talk with a friend, or call home. It may seem like you are wasting time you could be spending on that pesky assignment, but taking a break will help you refocus your mental energies so that you can be more alert and efficient when you return to your task. A messy desk or room can keep you from being the most productive you can be. Before you start on your assignments, take a few minutes to put everything back in order. You will be able to find the things you need more quickly, and a clean room will keep you from getting overwhelmed. Maybe Mom really was right when she always told you to go clean your room! You want to do even better this semester than last semester. Work hard, but don’t forget that college is also the time to make lifelong friends. In order to motivate yourself, talk to your friends and find a time and activity everyone is excited about. Use that as your reward for staying focused on school and work. The winter weather may mean that activities like swimming and hiking are out of the question, but there is still plenty to do -- you can watch movies, bake cookies, and explore the area around your campus. Do these tips make you feel more motivated for this semester? Let us know in the comments below!